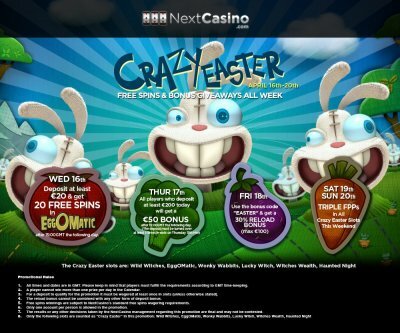 NEXT CASINO run a easter campaign where you could claim free spins and other nice casino bonuses. Each day of the Crazy Easter promotion give you a chance to get some great deals! Make a deposit of at least €20 on this day and get 20 free spins in Wild Turkey after 15:00 GMT the following day. All players who deposit at least €200 today will receive a €50 bonus after 15:00 GMT the following day. The deposit must be turned over at least 5 times in slots on 17th April.